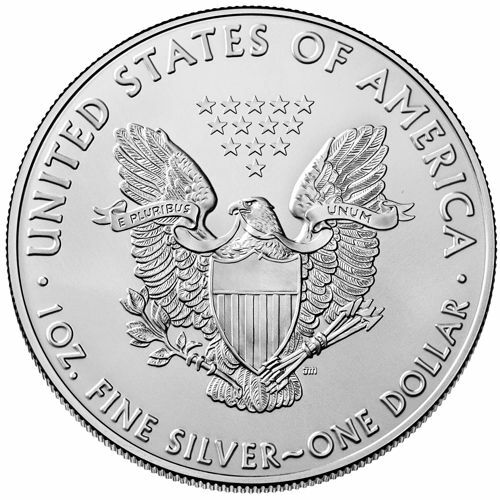 The American Eagle Silver bullion coin is the official silver bullion coin of the United States. On July 9th, of 1985, the United States Congress passed the Liberty Coin Act, the law authorized the US Mint to start producing Gold and Silver American Eagle bullion coins. The United States Mint first released the silver eagle coin on November 24, 1986. The silver coins content, weight, and purity are all certified by the United States Mint. The obverse side of the American Eagle Silver bullion coin displays Adolph A. Weinman's design of the "Walking Liberty." The design had originally been used in the United States "Walking Liberty" half a dollar silver coin, issued from 1916 to 1947. The design depicts Lady Liberty walking in front of the rising sun. She is cloaked in the American flag, with her right arm extended and her left arm cradling branches of laurel and oak. Adolph A. Weinman's initials can be found on the hem of Lady Liberty's gown. Inscribed across the top of the 1oz Silver coin is the word "LIBERTY." To Lady Liberty's left, are the words "IN GOD WE TRUST" and below her is the silver bullion coin's Year of Issue. John Mercanti, a senior United States Mint Sculptor, and Engraver, designed the reverse side of the 1 oz. American Silver Bullion Coin. 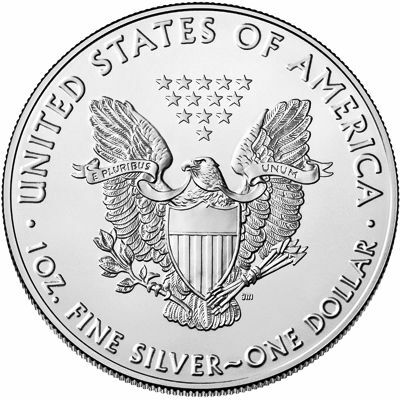 The reverse side of the silver coin portrays an American Bald Eagle, behind an American shield. The American eagle is grasping an olive branch with its right talon and arrows in its left talon, mimicking the Great Seal of the United States. The banner that the eagle is holding in its beak says "E PLURIBUS UNUM," which is Latin for "Out of many, one." Above the eagle is Thirteen, Five pointed stars, representing the original Thirteen Colonies. The words, "UNITED STATES OF AMERICA" are inscribed across the top of the inside perimeter of the silver coin. The silver bullion coin's Weight of "1 OZ.," Purity and Face Value "FINE SILVER~ONE DOLLAR" are inscribed along the bottom of the coin. John Mercanti's initials are located directly under the eagle's talon that is holding the arrows. Note: American Eagle bullion coins do not have a Mint Mark; only the Collector's Proof and Collector's Un-Circulated Versions of the Silver American Eagles have a mint mark, on the reverse side. 1 oz. American Silver Eagle Photos Courtesy of : The US Mint. The West Point Mint in New York is the primary location for all bullion coin production. However, when the West Point Mint cannot meet production demands American Silver Eagles are produced at the San Francisco Mint and Philadelphia Mint. The bulk of production at these two Mints usually happens during the transition time to a new calendar year. At the end and beginning of each year, the three facilities cooperate to ensure a sizeable inventory is available for purchase. January is often one of the busiest months of the year for the sales of American Eagle Bullion Coins. CoinWorld.com recently found out about the fact that the US Mint were incorporating the Philadelphia and San Francisco Mints to meet demand and wanted to learn more information. Below is a Video from the US Mint explaining the process of Minting the American Eagle Silver Bullion Coin. The Blog post's below explain the process of getting the mintage numbers above through the FOIA requests to the U.S. Mint. The following mintage figures were obtained by the US Mint through a FOIA (Freedom of Information Act) request. See the separate pages of the US Mint's answer to this guide's FOIA request submitted by Steven Warrenfeltz, seen here: page-1, page-2, and page-3.